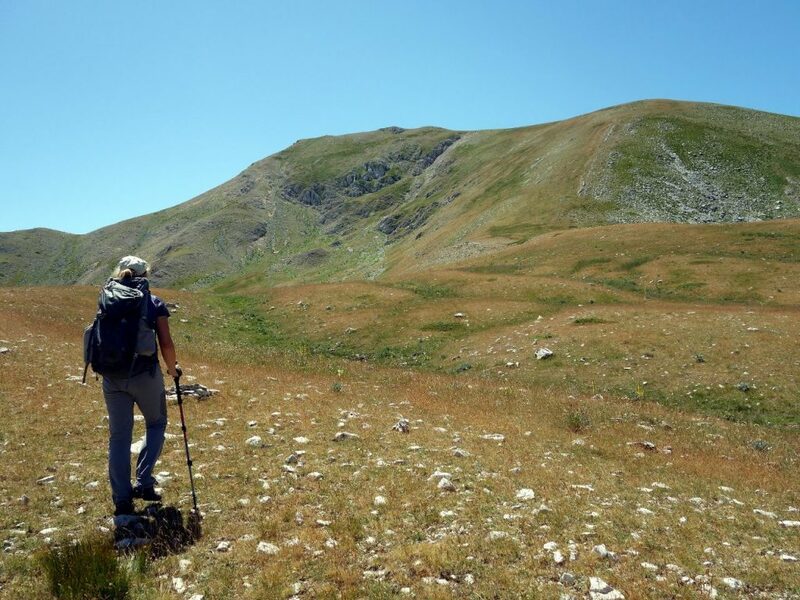 Since racing up Monte Marsicano from the southern Opi side on one of our very first visits to Abruzzo National Park in the Central Apennines, we’d had in mind to climb the mountain via a longer route from the more remote northern side. Monte Marsicano has special significance. Not only is it one of the most attractive mountains in that part of Abruzzo, but it’s the mountain from which the critically endangered Marsican brown bear takes its name. Only about 50 of these bears are believed to exist, mostly concentrated in Abruzzo National Park (of which the Marsicani massif is a part), with a few isolated animals in neighbouring ranges of the Apennines. 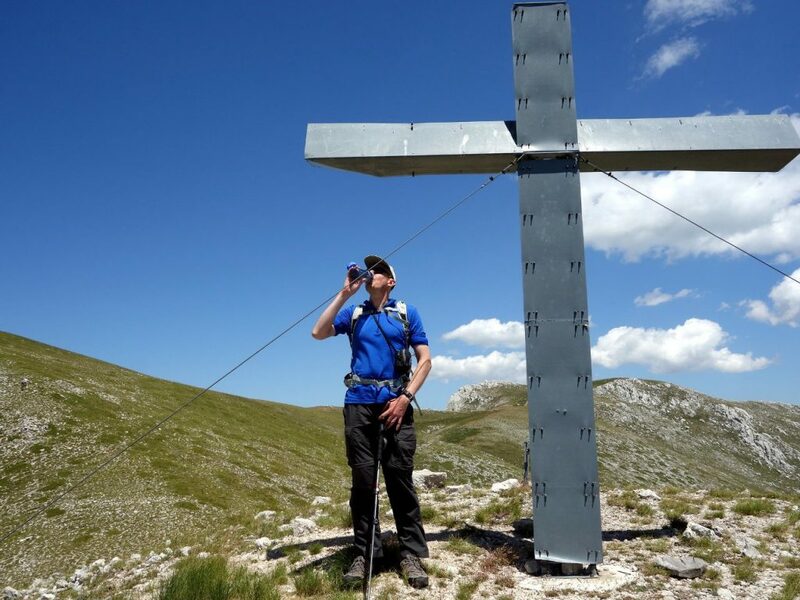 Our opportunity came in July last year, during a feast of hill walking which saw us complete epic days out on successive weekends in each of Abruzzo’s four best mountain ranges (Sirente-Velino, Maiella, Gran Sasso, and Marsicani-La Meta). 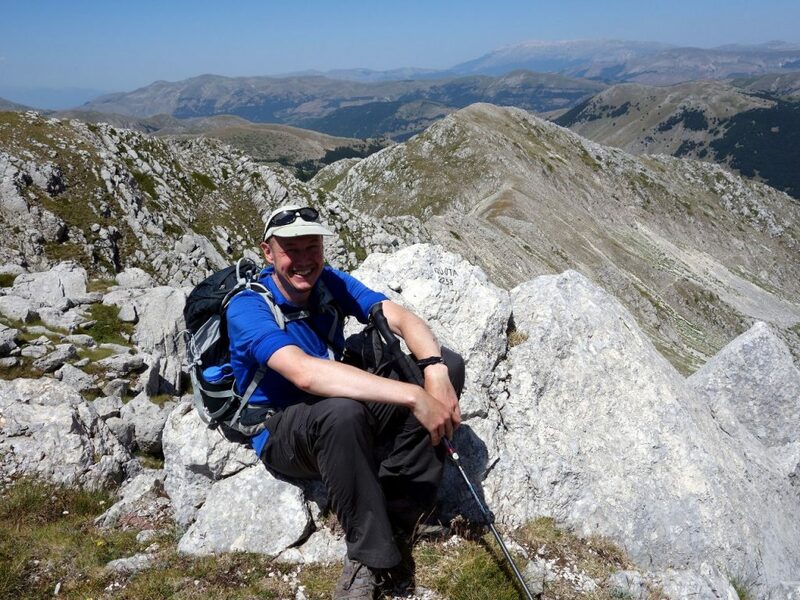 I’ve talked a fair bit about Munro bagging on this blog, but not so much about Apennine 2,000er bagging. 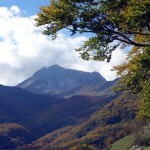 There are in fact 249 peaks in the Apennines over 2,000m in height. Although I’ve not counted them up, we must have climbed a fair few of them during our time in Italy. The route I had in mind on the north side of Monte Marsicano took in no fewer than eight, only two of which we’d climbed before. We started from Pescasseroli at 8.30am, a lively town at 1,150m on the west side of Monte Marsicano. July in central Italy is a sweltering place to be, and even at that altitude it was a very hot day. We took the marked Club Alpino Italiano (CAI) A9 trail as it zigzagged up into pine forest. After a quick 200m ascent we found ourselves in more open grassy terrain, with the gently rounded Monte Palombo (2,013m) up ahead. This isolated 2,000er wasn’t one of our eight peaks for the day. We soon re-entered forest and joined the A1 trail on a broad 4WD track, passing between Monte Palombo and another 2,000er, Serra Cappella which, if all went to plan, would be our last summit of the day. 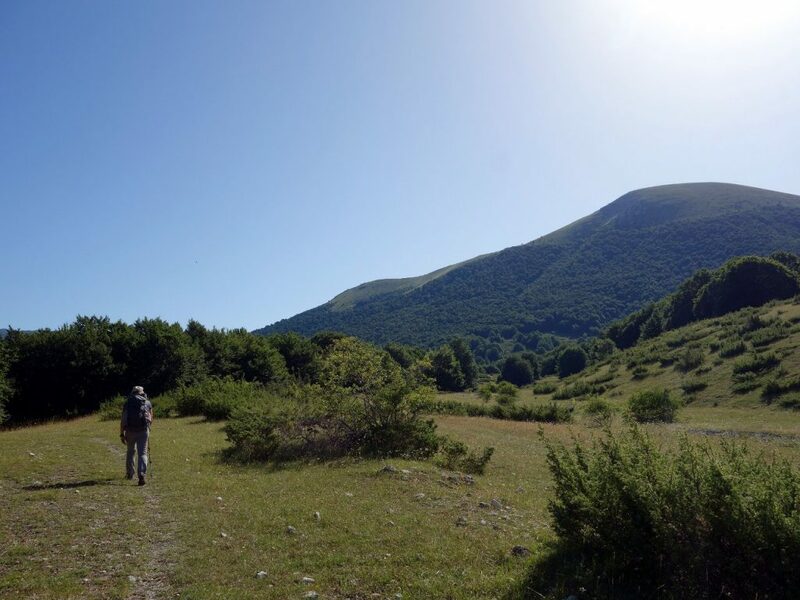 The trail was staggeringly quiet, and the only person we saw for the first five hours, between leaving Pescasseroli, and reaching the summit of Monte Marsicano, was an old man picking tiny wild strawberries beside the broad track on this section of trail. At 10am we reached a junction at a clearing in the forest. We had been heading north-east, away from Monte Marsicano, but here we turned abruptly south-east towards it, on the A6 trail. There followed a difficult section up a forested stream bed, on a trail which must be impassable in winter, when the snow-melt turns it into a torrent. Now it was dry, but steep and awkward on the ankles. I was happy to find the narrow side trail to the left, the A4, which took us away from the stream bed up a hillside. After a short, steep ascent, we reached an altitude of 1,800m and emerged from the forest onto bare grassy hillsides. There was a lovely feeling of remoteness here, with peaks all around us overlooking the forest. The trail continued east over a col, but we turned south into open country to climb our first summit, Monti della Corte (2,182m). 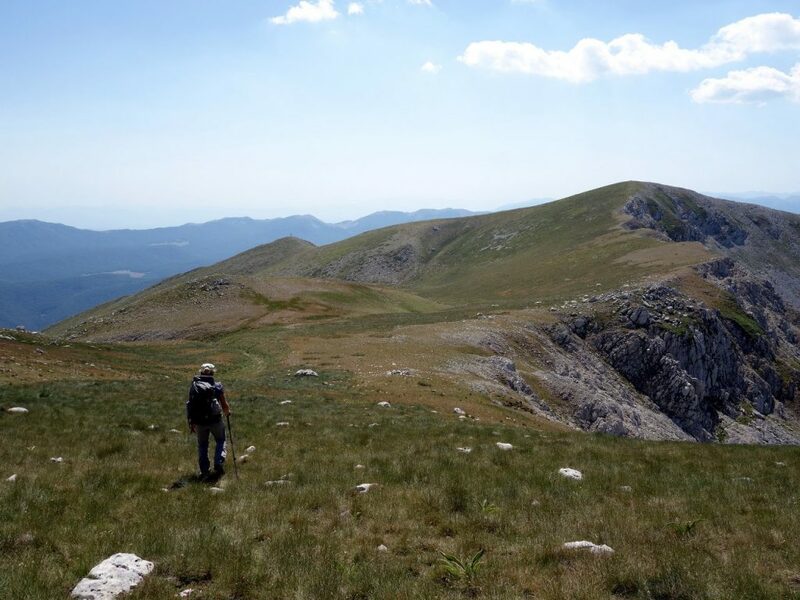 A few peaks rose above the dry stony grasslands, but Monte della Corte was obvious – it was much higher than everything else, a whaleback of a mountain with two obvious rises. The one on the left was obviously higher, with a few small, avoidable crags guarding its summit. We could see a herd of some type of animal low on this side. It wasn’t obvious what from where we were standing, but certain to be either the caprioli (roe deer), cervi (red deer) or camosci (chamois). Our host Simone in Villetta Barrea later told us that cervi were by far the most common, though we usually seemed to end up seeing camosci. This was one reason that we chose to take the direct route up the right hand rise instead, up a steep grassy ridge with no trail. We still had 300m to ascend, but we plodded up briskly. At the top we were in for a treat as we turned left along a broad ridge and took the final few steps to the main summit. 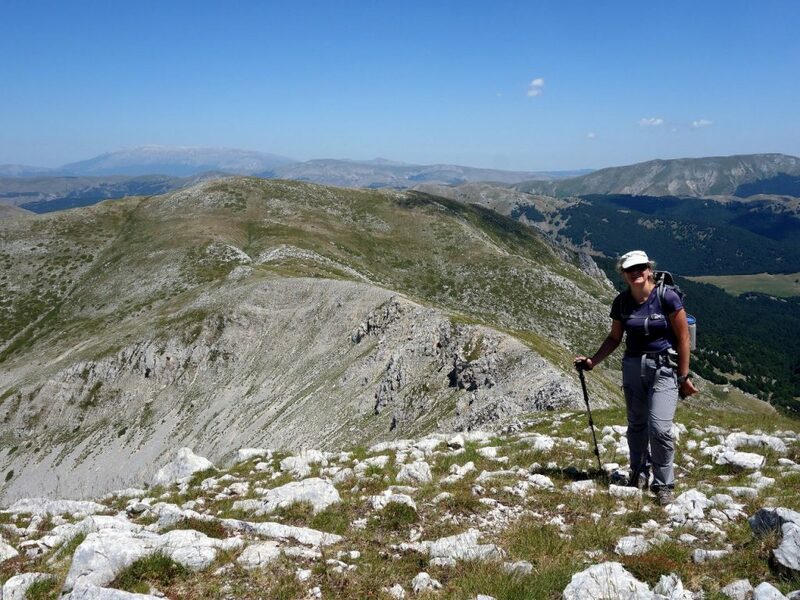 There was a fantastic view south into the huge mountainous basin on the north side of Monte Marsicano, including four of our remaining summits. Two of the others could be seen on a ridge extending north on the right side of the basin. It was 12.30, and it had taken us four hours to reach our first summit. There was plenty more work to do, but we were now up high, and only had to follow a system of connecting ridges to pick off the other seven. We had a choice of routes. We could aim for Monte Ninna on the left side of the basin, or Cima di Colle Angelo on the right side. Both would provide us with access to the other peaks of the Monti Marsicani massif, but if we took the right-hand option we would have to backtrack all the way back again. But peering over the brow it was a no-brainer. There was a steep 300m descent back to the forest line then back up again on steep crags to reach the top of Monte Ninna, while Cima de Colle Angelo was attached to our position by a ridge, dropping only 100m in between. Even with the backtracking, it seemed immeasurably preferable. We passed along the ridge on an old, indistinct trail which was no longer marked on the map, ticked Cima de Colle Angelo (2,217m), then continued round the basin to the summit of Monte Marsicano (2,245m), reaching its familiar iron summit flag at around 1.30. As far as summits go, Monte Marsicano is strange one, a gentle grassy fold on the ridge that has been chosen as the officially designated main summit of the massif. All around were ridges, forests and hills. Close by to the south was the jumble of contorted summits that comprised Monti della Meta. On the far horizon to the north, the rocky disc of Corno Grande, the highest peak in the Apennines, rose up freakishly higher than everything else. To the east a broad ridge continued, then rose a little to Monte Marsicano’s two eastern summits, which were actually slightly higher. Why the one we stood on had been designated the main summit instead of the higher one of those was a mystery. A quiet man was sitting on the summit cairn, reading the same Cicerone guidebook that served as our guide to Abruzzo when we first moved to Rome. ‘That’s a great book,’ said Edita, but he seemed a little uncomfortable and didn’t reply. 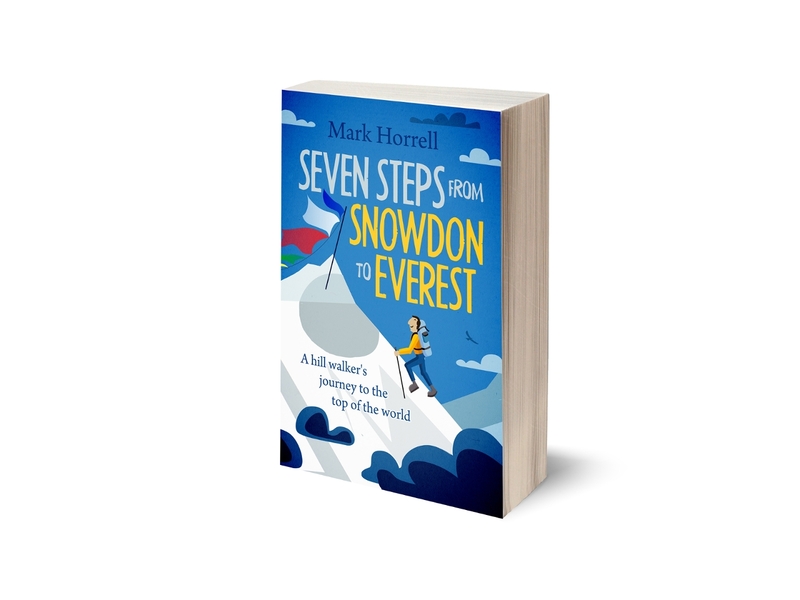 ‘I don’t think he likes the book,’ she said as we continued to the next summit. ‘Perhaps he prefers reading in English to talking it,’ I said. Anyway, whatever the reason, he followed us to the next two summits, so Edita can’t have upset him that much. A few moments later, we had another strange language experience when two more hikers (presumably Dutch) asked us in English if we spoke German. ‘Then do you speak Dutch,’ he asked. ‘Er … how about English?’ I helpfully suggested. Luckily they asked a question for which we knew the answer – the route down to Opi on the E6 trail. We came that way on our previous ascent, and I was able to see the trail across dry grass slopes and point it out to them. 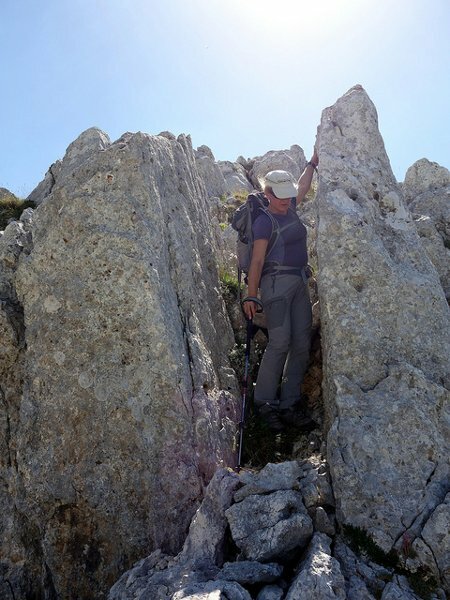 Our next summit, Monte Calanga (2,168m), wasn’t what I would strictly define as a summit, just being a lower shoulder of Monte Marsicano that was raised slightly. But it was classed as one of the 249 Apennine 2,000ers, so we went there. It had a summit cross quite out of proportion to its prominence. The cross was a large grey metal contraption big enough for a crucifixion. 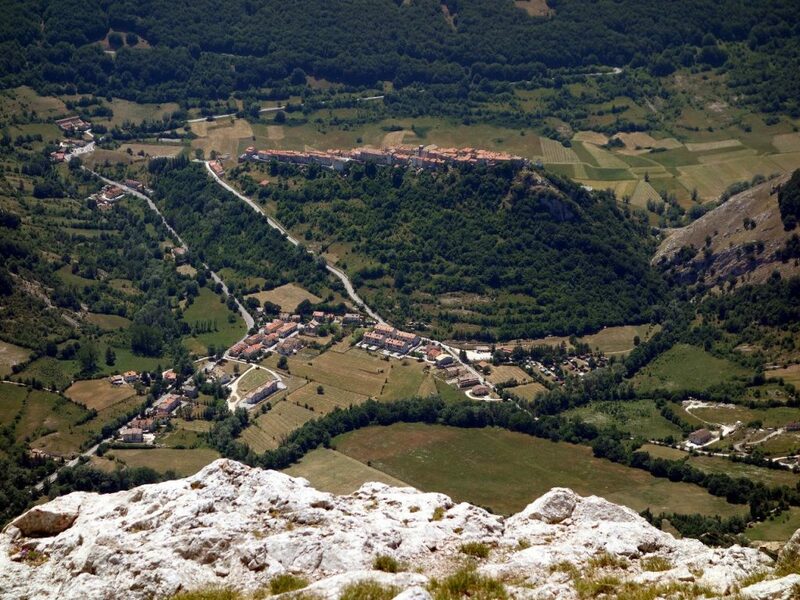 Its size could be partly explained by the view from the summit down to the village of Opi. From the road, Opi is quite a striking village, built right at the top of a small free-standing hill. I’ve been intrigued to visit it every time we’ve driven past, but we’ve never got round to it. From Monte Calanga it struck me that the whole thing, village and hill, was shaped exactly like a coffin. They can probably see this massive cross from every street corner. I’d be concerned about zombies if I lived there. With the peak bagged, we headed back up to the main summit ridge and traversed to the east peak Monte Marsicano Est (2,253m) which is not only higher than the main summit, but terminates at a cliff edge and arguably has a better view east towards Monte Greco. As we sat on its northern summit, eating our lunch, we looked across to the next peak Monte Ninna (2,220m), a lower outcrop at the far end of a subsidiary ridge. 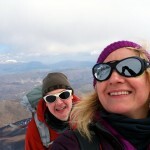 I confessed to Edita that I believed this particular summit might be inside the protected area. Abruzzo National Park has several of these, to protect the camosci and other animals during breeding season. Some of these areas are only closed for parts of the year, but we believed there were others that you weren’t supposed to enter at all without a park ranger. We never quite knew the rules, and nor did anyone else. By the time we finished our sandwiches, it was late afternoon and we seemed to have Monte Marsicano to ourselves again. With Monte Ninna so close, it seemed a shame not to visit it just because we didn’t know if we were allowed. 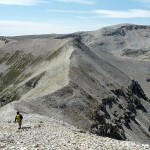 There was a mini scramble down onto the subsidiary ridge, with one tricky move around the side of a large rock. I decided to leave my backpack and pick it up on the way back. There was a gentler stroll up to Monte Ninna’s summit, where we looked back across the north Marsicano basin to our first peak, Monte della Corte. On the way back we did see some camosci on the cliffs below Marsicano’s east summit, and one even treated us to a clifftop dance. Italian hikers always get excited about these native mountain goats, and areas that camosci are known to inhabit often get more visitors. I had lost count of the number of times we’d seen them on quieter mountaintops. It was a regular occurrence for us, but it was always exciting. We now had to backtrack all the way back over Monte Marsicano and Cima de Colle Angelo to join the ridge to our final two summits, Serra Cappella Sud (2,056m) and Serra Cappella Nord (2,038m). We were nursing the last of our water. It was 4pm and we still had a long descent over unfamiliar terrain. I heard Edita call our host Simone at our favourite B&B in Villetta Barrea to say we’d be there at 8pm. This seemed longer than we needed, but in the event she proved to be exactly right. Serra Cappella was just a long grassy ridge projecting into the forest, with two high points that were classified as 2,000ers. We crossed them both and finished the last of our food at 5pm on the second, northern one. It was an ugly summit with some old bits of rusty iron protruding from the ground. There was a slight wind, but it was warm and fresh. I was tired, and we had a longish rest there, believing that we still had plenty of time. 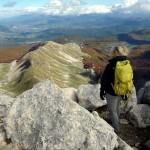 Our day’s main problem came on the way down, when we descended west from the ridge into the forests above Pescasseroli. There was a faint trail marked on the map, but it wasn’t an official paint-marked CAI one, and we lost it as soon as we entered the forest. Edita raced down a tiny trail that eventually petered out. We reached a more open section, and headed straight downwards. After a rapid descent of about 200 vertical metres, we reached the trail that we should have been on. By then it was much broader and easy to follow. It was 6.45 and we were on a magnificent elevated trail, with the mountains we had just ascended to our right, and the forests and the plains around Pescasseroli to our left. It was a balmy evening, and the forested hillsides were a joy to behold, but we had an 8 o’clock rendezvous, and we didn’t stop to admire the view. We speed-walked briskly along the trail until we joined up with the A9 we had taken that morning. We were back at the car at 7.30pm, tired but exhilarated, after an 11-hour day and 8 summits. Pescasseroli was lively, but we drove through, keen to enjoy Villetta Barrea, one of our favourite villages in Abruzzo. I hope we will return some day. You can see all my photos from that day starting a few pics into page 4 of the Marsicani and Monti della Meta Flickr album. We completed this walk a year ago, shortly before leaving Rome to move back to London. I have written up this trip report from notes that I jotted down at the time. ← Flashing on Everest: is it safe or sensible? Thanks for an enjoyable read. You might want to edit your translation of the words for the different type of Deer. Capriolo are Roe Deer and Red deer are Cervo. If you are ever back that way, head to Frattura, above Scanno at the end of Sept, beginning of October, for the Stag rut. Yes, you’re right. Thanks for spotting. Now corrected.